There is a petition, 'Carnival Sense and Sensibility for 2011 and beyond!' 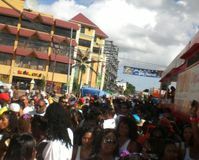 against banning the use of portable toilet facilities, (referred to colloquially as "wee-wee" trucks) by private bands on the parade route of Port-of-Spain, which is proposed to take effect for Trinidad Carnival 2011. These decisions were made public by an article in the Trinidad Express: Taking back Carnival for 'ordinary' people. If there's not going to be enough toilets you sure will remember the next Carnival - for all the wrong reasons.